BlackBerry PlayBook? Access the BlackBerry App World. If you have a prior version of TouchTax installed, access your application market and check for updates. The application market program should notify you automatically if updates are available. Downloading and installing TouchTax is done automatically by the applicable application store. Note that it may take several minutes to complete the installation due to its size. Since TouchTax incorporates the complete Code and Regulations for offline, anytime access – all 7,800+ individual sections – the application packs a whooping 25+ MB. Depending on your Internet connection, this might take a while to download. Once you have TouchTax installed, open the application. When the application has loaded, you’ll be presented with the main screen, shown below. Note that the layout may differ slightly depending on what type of platform is being used (for example, Android versions of TouchTax currently do not include the split screen mode – a feature that will be added for Android tablets in coming revisions). 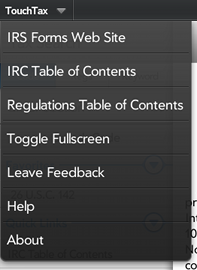 On the left side, you’ll find the “Tax Search” options, beginning with a row of three buttons indicating the current search setting, the search input field, the search button, a listing of favorite Code and Regulation sections, a listing of commonly requested links (including links to full tables of content for the Code and Regulations, and a link to the Internal Revenue Bulletins) and, finally, a toolbar at the bottom showing the “Home,” “Delete Favorites” and “Share” buttons. To search for a specific Code section, enable the “Code” button at the very top, then enter the exact Code section (numbers only) (e.g., 1031) and finally click “Search Code.” If you entered a valid Code section, the screen on the right will load the relevant Code text. If you entered an invalid Code section (either the Code section does not exist, or your entry contained invalid characters), a popup message will explain the error. Enter a valid section and click the search button again. 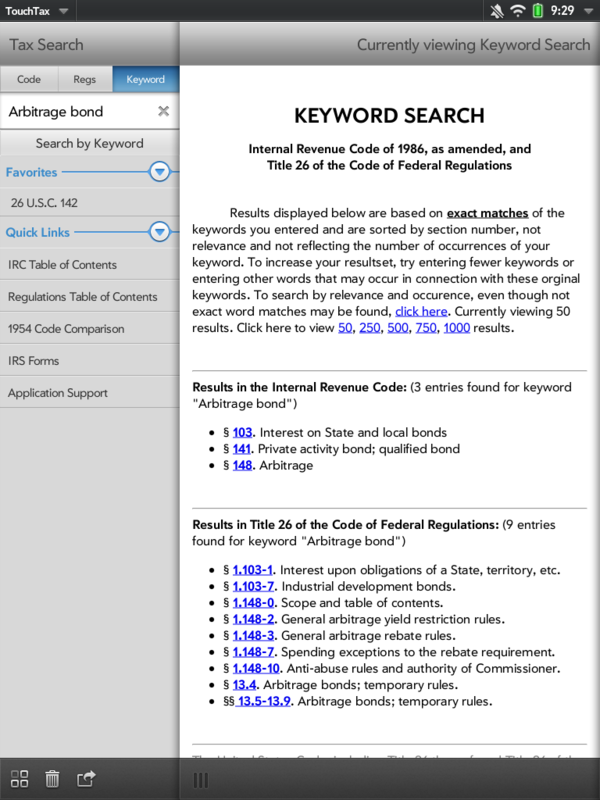 To search for a specific Regulations section, enable the “Regs” button at the very top, then enter the exact Regulations section (numbers, periods, dashes and brackets) (e.g., 1.148-8) and finally click “Search Regulations.” An error message will display if you’ve entered a non-existing section or invalid format. To search for relevant sections using a keyword, enable the “Keyword” button at the very top, enter your search term and click “Search by Keyword.” The exact phrase you entered will be searched within the titles and texts of all Code and Regulation sections. Once the search results load, you have the option of redoing the search using a natural language, relevancy search – the relevancy search is described in the first paragraph of the search results page. The application menu contains duplicates of certain commands that are also shown as icons or buttons in the main application views. The menu on HP/Palm devices is located at the top left. For Google Android/Amazon Fire/Barnes & Noble devices, the menu may be located at the bottom of the screen. For Apple iOS and BlackBerry PlayBook devices, the menu will show up under the “Menu” button at the bottom left of the application. Click the desired menu option to effect the action you wish to accomplish. Descriptions for most of these menu items are described under the other headings of this “Getting Started” guide. The menu item at the very end shows information about the version and copyright of TouchTax. If you’ve used LexisNexis or Westlaw before, you are probably familiar with the book browse feature. 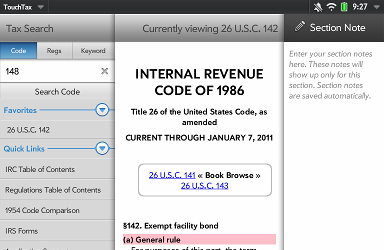 Book browse lets you “flip” through the Code and Regulations page by page. When a Code or Regulations section loads in TouchTax, use the book browse indicator at the top of the page or the back and forward buttons at the bottom of the page to advance or go back, section by section. Note the “Show related Treasury Regulations” feature. Thank you to the user who suggested this improvement. Touch the “Show related Treasury Regulations” feature to quickly scroll to the list of Regulations relevant to the current Code section you are viewing. This feature permits quick access to the Regulations without requiring another search or manual lookup. Once a Code or Regulations section loads, you can bookmark that section by clicking the “Bookmark” icon at the bottom right of the section page. The section will then appear in the list of Favorites on the left side of the screen. To remove a favorites item, simply swipe the item in the list from left to right and click “Delete.” This feature may not be available on all device systems. You may also use the “Delete Favorites” icon at the bottom of the left screen to delete all favorites from the list. Note that the bookmarked section now also shows the title of the Code or Regulation section. This is a new feature in version 2.5.0. Once a Code or Regulations section loads, you can add custom notes that will appear together with that section. Click the “Notes” button at the bottom of the section viewer, right between the left and right bookbrowse arrows. A panel will appear to the right. Text that you type into this panel is automatically saved to the TouchTax database and will appear each time you open the related section. Thank you to the user who suggested this improvement. You may expand the notes panel to the full screen size by holding onto the “grab” button at the bottom left of the panel and pulling it to the left. Once you pull far enough, the panel will automatically transform into a full width panel. To view the smaller panel again, simply pull back the panel on the grab button. You can do the same with the main section viewer to expand and reduce the viewer’s width. Once you click on the blank note box, the onscreen keyboard should appear automatically. You may use the onscreen keyboard or, alternatively, your bluetooth-connected keyboard to type your notes. Your notes are saved automatically – there is not need to separately “save” your notes. To delete a note, either hit the “back” button on your keyboard until the text disappears, or click the “delete” icon at the bottom right of the notes panel. 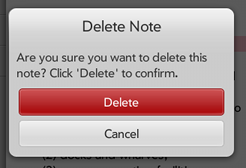 A notification window will appear requesting your confirmation to delete the note. You can email notes, along with the full section as an attachment, by clicking the “Send” email icon, described below. Any notes associated with the currently shown section will be included in the body of the email. If there are no associated notes, the email will contain only the section as an HTML attachment. See the next heading for more information. Note that all notes will be removed from your device if you choose to uninstall TouchTax. Those notes cannot be retrieved again, so be sure to backup all your important notes by sending them to yourself by email first! To ensure privacy and any client confidentiality matters, TouchTax will not backup notes to any Internet server – your notes are stored exclusively on your device. 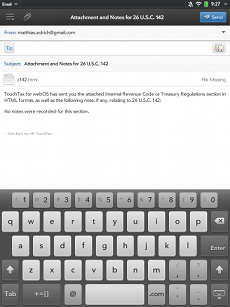 My favorite feature of TouchTax is the ability to send an entire Code or Regulations section as an attachment by email, as well as any corresponding notes. To send a section by email, simply load the section and click the paper airplane “Send” icon at the bottom right of the section viewer. As described under the “Notes” heading above, notes associated with a particular section are included in the body of the email. If a particular section does not have any notes, the email will contain only the section in HTML format. Note that the email will be sent using your standard email client – you will need to reference your email client’s manual for information on how to use that application. On Apple iOS and Android devices, the attachment is in the form of a download link. In version 2.x of TouchTax, printing functionality is available only for HP/Palm webOS 3.0.x. Printing Code and Regulation sections is easy – simply load the relevant section and click the “Print” icon at the bottom right of the section viewer. 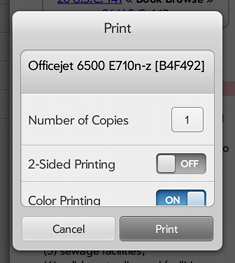 See the HP/Palm documentation on how to set up your printer and the system’s default print dialog box (shown below). Apple iPad and iPhone, and Google Android printing features may be added once Apple or Google enable printing for their systems. Consider getting an HP/Palm device running webOS! The reading pane can be switched to fullscreen viewing mode. To toggle between fullscreen viewing and regular viewing, either select the fullscreen icon in the bottom toolbar, or select “Toggle Fullscreen” from the menu. If you switch to fullscreen mode, you will no longer be able to expand or reduce the main viewer’s width (obviously, because the frame and grab bar disappears!). Once in fullscreen mode, in order to switch back to view the side bar, you will first need to toggle the fullscreen mode using the “Toggle Fullscreen” option in the menu. Fullscreen view is not necessary or implemented for Android devices. Use the “Sharing” icon button at the bottom of the panel on the left to share TouchTax or leave feedback. 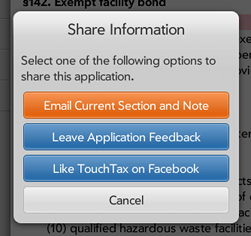 When a Code or Regulations section is in view, the share dialog box will also show the orange “Email Current Section and Note” button. Click “Cancel” to close the Share Information dialog box. If you enjoy using TouchTax, please consider sharing your feedback using the “Leave Application Feedback” share button. Your feedback is valued greatly. Please also feel free to “Like” the TouchTax Facebook page (if you are into that sort of thing!). The share dialog box also shows a link to email the current section and note. This button does the same as clicking the paper airplane icon link on the main section viewer panel. Thank you for purchasing and downloading TouchTax!